Negatives: The dual action fat burner and appetite suppressant has a pretty unbeatable product in PhenQ – everything else in our opinion is a compromise. 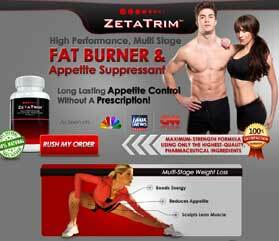 ZetaTrim is marketed as a “high performance multi-stage fat burner and appetite suppressant” that can boost energy levels, sculpt lean muscle, and enable people to burn calories and “shed pounds” without spending hours in the gym. Fat burner/appetite suppressant combos are arguably the most popular kind of weight loss supplement available, but it has to be said many such formulations fall well short of the intended mark and can often leave customers sad and disappointed. Each (2 capsule) dose provides 725mg of a proprietary blend and, as is often the case, information about the ingredients incorporated therein does not include the inclusion rates. 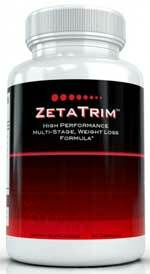 ZetaTrim capsules also contains a few vitamins and minerals that are additional to the proprietary blend. B vitamins aid the conversion of carbohydrates, proteins and fats into energy. If the body does not receive a sufficient amount of them the metabolism is retarded, energy levels become depleted, and weight gain is likely. Bearing this in mind, it is not so surprising that B vitamins are a favoured ingredient with so many supplement manufacturers. Chromium is often associated with fat burning. In the 1950s it was dubbed “the glucose tolerance factor” after studies conducted on obese rodents indicated it had potential as a weight loss aid. The strength of these results caused Chromium to become a very popular fat burning ingredient. It remains so to this day, even though recent studies have been less supportive of its abilities. Looking at some of the scholarly articles published on the subject, such as this one; it becomes apparent chromium (for weight loss) requires further study. The inclusion of Chromium and B vitamins certainly indicates a potentially good formula, but the majority of the active ingredients are hidden in the proprietary blend. Guarana is a caffeine provider, and it’s potent, but the caffeine in guarana is released quite slowly. This allows the benefits it offers to be longer-lasting, and its inclusion here, if included in sufficient quantity, may help give the metabolism a boost. Fucoxanthin is a seaweed extract that is believed to stimulate fat burning, and E&Z guggulsterones has a reputation for regulating the metabolism, but in both cases further study is warranted. 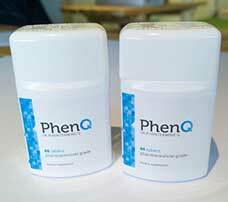 DHEA (dehydroepiandrosterone) is a hormone secreted by the adrenal glands. It can also be manufactured from soy or wild yam. It is a popular inclusion in weight loss supplements and bodybuilding formulation alike, and there are many claims made for its potential in both areas, but experts at the Mayo Clinic agree the ingredient requires further study. Garcinia Cambogia is easily the most promising blend inclusion. As an effective weight loss provider its reputation is second to none, but its abilities may be hampered if it is not included in sufficient amount. Garcinia cambogia is a fruit. The rind contains a compound called hydroxycitric acid (HCA) that inhibits the citrate lyase enzyme (required to convert excess carbohydrates into fat). It further assists weight loss by boosting serotonin levels to improve the mood and decrease the likelihood of comfort eating. In recent years garcinia cambogia has become the go-to weight loss aid for many Hollywood celebrities, including Christina Aguilera, who used the ingredient to get into shape prior to her appearance on The Voice (NBC TV Show). Two capsules should be taken twice each day with a full glass of water and, for best results, should be consumed immediately upon waking and then again 30 minutes before lunch. Capsules should never be taken within 6 hours of bedtime. Side effects are unlikely, but pregnant or nursing mothers should always err on the side of safety and avoid using any form of dietary supplement unless its use has been sanctioned by a doctor. People who have existing health problems, or are taking medication, should seek the advice of a trained medical professional before commencing supplementation. A “100% Satisfaction Guarantee” is offered, but the ZetaTrim website fails to provide any information on its duration, or how to claim a refund should one be desired. A single bottle of ZetaTrim costs $24.95 when purchased from the official website, but bulk buy discounts are offered, with the best deal going to customers who pay $74.85 for three bottles and receive an extra two bottles for free. ZetaTrim is also available via the Amazon Marketplace, and Amazon customers can generally purchase two bottles for just $23.95, so, for value for money, Amazon may be the way to go. As we have mentioned in the opening of this review the dual mechanic of action type diet pills are not uncommon nowadays but it was arguably the market leader PhenQ that introduced the concept.